It is perhaps the best known verse in the New Testament, if not in the entire Bible. It is the most commonly memorized, the one most frequently on signs at football games. 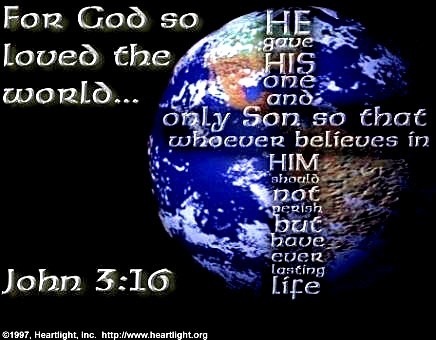 It is John 3:16. And it should be that way, for there despite its milky appearance, this verse is loaded with meaning and significance. So lets take it apart and see what we can find in there. First and foremost, this verse is not telling us about a ourselves. This verse gives us a look at the character of God. God is the initiator in this relationship. He was not responding to mankind’s collective plea for help, for at the time we were not just ignorant of God, we were His enemies. Romans 5:8 says that “God demonstrates His love for us in this”. As the apostle John later writes in his first letter, “In this is love, not that we loved God, but that He loved us and sent His Son to be the propitiation for our sins. (I John 4:10). God did not pick out just a few elect persons to save. He did not come and make provision for the salvation of one man. No, Jesus was sent to “seek and save the lost”. To do that, a sacrifice was needed that was sufficient for everyone. The God who is love personified, became a person to show us His love. Love does that. It gives. God wasn’t sitting up in heaven having feelings for us. He acted and demonstrated His love. When infinite love gives, the gift is of infinite value. God did not create an angel and send him down to be our sacrifice. He is so in love with us that He gave that which is dearest of all to His heart — His Son. I have three sons, and I cannot imagine willingly sending one to be tortured and killed for my enemies. But the infinite love of God did just that. While the gift is sufficiently valuable for all, it is only efficacious for those who accept it. It is just like when a doctor writes you a prescription so you can recover. You can leave the bottle on your nightstand for months and years, and it will do you no good whatsoever. You have to take it for it to work. In the same way, if we don’t believe in Him, we will not be saved. And thankfully the invitation is to “whoever” which is a group that includes each of us! We were all condemned to die. We were without God and dead in transgressions and sins. But Jesus came to give us life (John 10:10). We, who were His enemies, now will live with Him forever. The next verse, john3:17, says it this way. We were already condemned. His mission was to save us. God loves us and did everything to provide us a way back to Himself. And that is what the Lords Supper is about. As we look at the unleavened bread and the fruit of the vine, we are reminded not only of His broken body and His blood that was shed for our redemption. We also recall the love that motivated such a sacrifice for ones as undeserving as us. Yes, it is love that causes grace, that saved a wretch like you, and you, and me! It is often said that if someone could find a way to be in two paces at the same time, they could patent it and be rich. But we all know that for mere mortals, it is impossible to be in two places at the same time. The same is true in the spiritual realm. Consider the following examples from the Word and see if it is true. 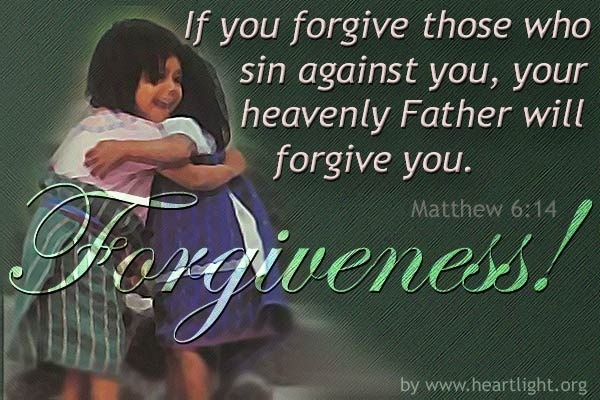 You cannot be in unforgiveness and be receiving forgiveness at the same time. Jesus gave his followers a somber warning. 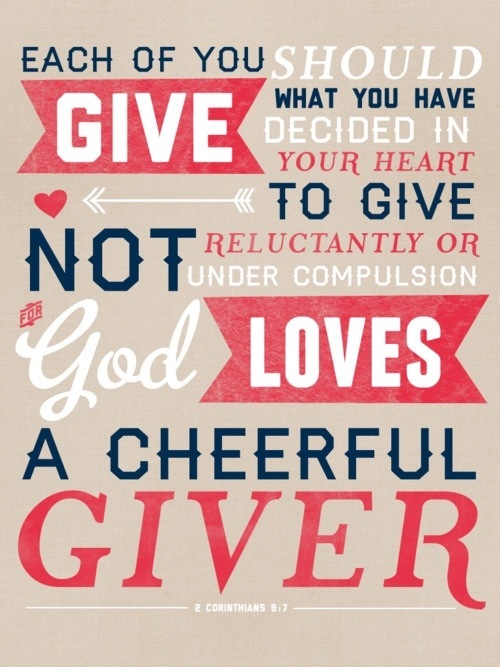 We cannot expect God to give to us the very thing we refuse to give to others. That is deadly serious. Who wants to stand before God with unforgiven sin? And the results are not just in the hereafter. Unforgiveness also damages out relationship with God. Our prayers go unheard and we are effectively isolated. What offense committed against us is worth the equivalent of spiritual suicide? Unforgiveness also defiles those around us. This can happen when we stop believing that the Lord will take necessary steps for justice, and take matters into our own hands. We are glad to have been forgiven, but judge others as unworthy of that same grace. Hint: No one is worthy of forgiveness. That’s why it’s called grace! You cannot give little while receiving much. Jesus himself shared this eternal principle with his disciples. Where this falls apart for us is when we say we believe that God will take care of our needs,, but hold back for ourselves just in case he doesn’t come through. You cannot be in the light and in the darkness. There is no mixture of light and darkness in Christ. Thus, if we are walking with Christ, we cannot be walking in darkness. If you are in darkness, then you aren’t with Christ. When we get into unbelief, and stop believing the He came to give us abundant life, we start trying to have a little “happiness” based on what we want instead of what God says is best for our lasting good. Mammon is not just another term for money. Mammon is the mentality that says our goal in life is to earn money, to the neglect of more important things. Mammon makes money on idol and turns us into its slaves. And our God will not tolerate idols in His presence. Mammon lies to us by saying that we need to make sure God doesn’t plan to give us as much as we want, so it’s up to us to make up the difference in the amounts. You cannot walk in love and walk in hatred. In the final analysis, hatred is the quickest route to darkness and away from God. God is love, and we are supposed to be dwelling in Him. Hatred is antithetical to walking in love. We would all benefit from a thorough self examination. Or better yet, examine ourselves in light of the Word of God and act on what we see. God has promised to aid us and give us the grace and power to repent and drive this double mindedness from our lives. 1. Have I truly forgiven those who have trespassed against me from my heart? 2. Do I walk in the light, or is my life a cover for secret sin? 3. Is money a servant that I use, or has it become the mammon and master? 4. Is there any hatred in my life? How do I feel when certain people are mentioned? 5. What am I going to do about the answers to these questions?